The drive from Big Bend to Marfa was voted one of the top ten drives in North America. The road winds along the mountains and below is the Rio Grande, the only color against the rocks. We have seen all sorts of border control vehicles and went through two check points. I think there were more of their cars than the those of the locals. Marfa was interesting. The main attraction is the Chinati Foundation, a WWII fort that houses about a dozen installations that were specifically designed for the abandoned buildings. This was the vision of one man, Donald Judd, one of the "founders" of the Minimalist movement. In addition to visiting the fort, we also saw his home and studio. Inside two giant structures were his early pieces, including what were the inspiration for the 100 boxes. It is rare to see that much work of one artist in one place, to note the progression of his ideas. There is a third tour, with his early work, paintings, which we did not have time to do. 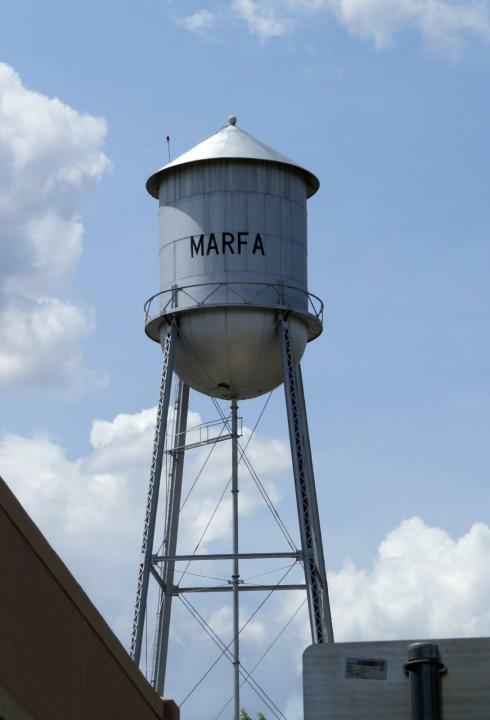 Marfa's population at its peak was four times the size it is now, so there are lots of abandoned structures. Just as the art is minimalist, so is the town, with very little signage and very little to do. There were lots of artists here until about three years ago, when the economy tanked. I think they are now waiting tables. Marfa is in the middle of nowhere, so it is hard to find folks who are in the area and might also want to buy a painting. It must be a very small group. But we really liked it and the four hour tour of the Foundation was one of the highlights of the trip. Google the foundation because there is not enough space to describe what it is, probably nothing else like it in the art world. Nearby Ft. Davis, where we stayed, has a restored Civil War (what is civil about a war?) era fort which we enjoyed touring. Really well done. I did not remember that Pancho Villa was roaming this area before WWI and there was a lot of fighting around these towns. Ft. Davis was important to the defense. Marfa My kind of place!